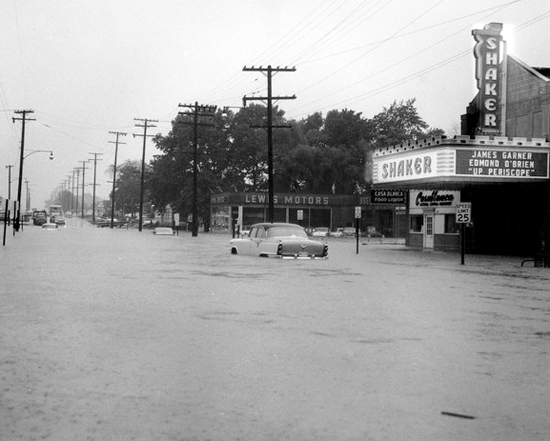 This 8.5" x 10.25" (21 x 26 cm) photograph shows Lee Road in Shaker Heights, Ohio during a 1959 flood. The movie theater was badly damaged, as were portions of track and stations along the rapid transit line. Shaker Heights is in the Doan Brook watershed, which feeds the Shaker Lakes before flowing through Rockefeller Park in Cleveland and into Lake Erie. The average dry weather flow of the Doan Brook is modest but development in Shaker Heights and other communities along the watershed increased groundwater discharge into storm sewers. Doan Brook was channelized in 1926, with renovations to the system in 1932 and 1955. On June 1, 1959, a rainstorm dropped 3 inches of rain in one hour on the drainage basin. The result was a flood flowing 10 feet deep in some areas. Shaker Heights suffered dramatic flooding, especially at the Chagrin Boulevard/Lee Road intersection in the Moreland neighborhood.